It is an cantilever single stage single suction centrifugal pump .This Pump is Designed to transmit the corrosive mediums which contain particle or crystallization . 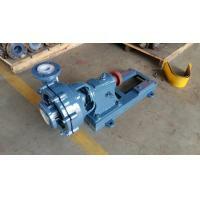 The Pump use the Cast Iron which lined with Ultra-high Molecular Polyethylene (UHMW-PE) molding process to manufacture the pump . So it has premium performance in corrosion prevention and wear resistance . Cantilever structure is designed to open in front semi-open impeller (No Front and Back Panels) .This Design enhance transfer liquids trafficability in Pump Chamber. And it can make the medium particles and impurities quickly through the pump chamber without block . The sealing type are choose gland packing with K Type Fluorine Rubber sealing Ring outer zone cooling water device.and it meets the requirements of corrosion prevention and wear resistance. 1) To Deliver Corrosion Sulfuric Acid ,Hydrochloric Acid, Alkali liquids ,clean liquids simlar with Oil, Slurry etc... In Chemical Industrials . 2) To deliver electrolyte solution,cprrosion slurry ,Filter press slurry, sewage in Non-ferrous metal smelting field. Electronic Pharmaceutical ,Paper-making , Textile ,Food ,life waste water in Water Treatment ,Enirvonment protection industrials . 6) To treat Sulfuric Acid ,Hydrochloric Acid pickling system ,sewage with impurities Transport in Steel Iron Enterprise . Pipeline Pressure to allow inhalation of 0.3Mpa.